Walden Pond Books is Oakland's largest independent bookstore. Founded in 1973 by Marshall Curatolo on Grand Avenue in the Grand Lake neighborhood, this bookstore is a beloved community institution. This is Walden Pond's third and largest location on Grand Avenue. Reflecting an East Bay literary sensibility, Walden Pond carries a lot of radical/leftist literature and work by local authors. The bookstore has a large selection of used books, but also a selection of new books fitting the above sensibilities. They tend to have a decent selection of the Oakland books from the Arcadia series. They also have a rare/antique books selection in a separate room in back which has it's own special hours of operation. Walden Pond is located right next door to the Boot and Shoe Service restaurant/cafe. Since the restaurant often has long lines, many waiting people are often seen browsing the Walden Pond aisles, their eyes vacant with pizza hunger, briefly lingering at the cookbook section before howling a single note of bestial pain at the realization that the pizza on the cover of The Wood-Fired Oven Cookbook is as illusory as the 15 minute wait time the Boot and Shoe hostess gave them 45 minutes ago. However, it is an absolute delight to buy a book at Walden Pond and enjoy it on the sidewalk with a cup of coffee from the Boot and Shoe cafe. 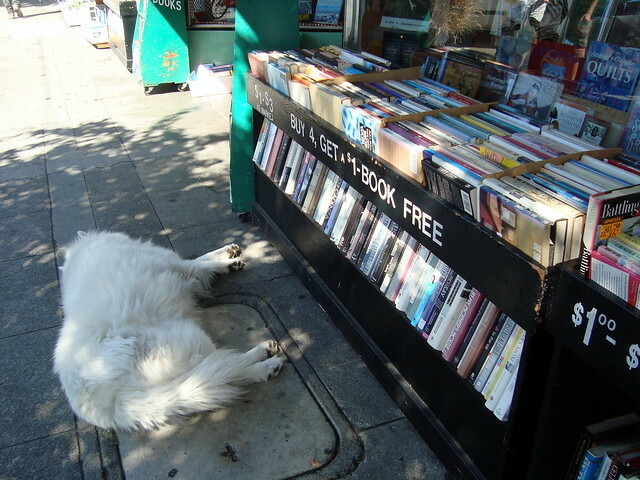 Two adorable samoyed dogs were known to lounge about the store on occasion, but have since passed away. Won 2014 "Readers' Choice" Best Bookstore in Oakland Magazine. Walden Pond was the recipient of the 2015 East Bay Express Readers' Poll Award for Best Bookstore. Even though an article referenced below calls Walden Pond Books "Oakland's Oldest Bookstore", there are actually two existing bookstores that are older: Marcus Books and Pegasus Books. Sunday to Thursday: 10:00 a.m. to 9:00 p.m.; Friday & Saturday: 10:00 a.m. to 10:00 p.m.